If Britain leaves the European Union, the European Union itself, in terms of its geopolitical strategy, will be much stronger. Apparently, Britain represents the Atlantic Alliance's interest - it was, particularly, the voice of the United States in the European Union. Without this Atlantic presence in the decision-making of the European Union, it will be much more independent from the Anglo-American alliance. And this would possibly mean a more independent foreign policy; there could also be a change in the EU’s policy regarding the Russian Federation, writes David Lane, a Fellow of the Academy of Social Sciences (UK) and Emeritus Fellow of Emmanuel College and Cambridge University Fellow of the Academy of Social Sciences (UK). There are four scenarios. First, the parliament can accept the present proposal of the Prime Minister. Second, it can accept some sort of modified version of that, which seems unlikely. Third, the parliament can postpone the decision, or fourth, it can leave the European Union with no agreement with it. Those are the options which are open. There is a crisis of parliamentary democracy in Britain, in the sense that the views of the elected representatives are distant from the British population. The Leave supporters won by a 4% majority. There is a very high proportion of the House of Lords who wish to remain in the European Union. Theresa May herself, for example, was in favour of remaining in the EU. That is the problem. The Theresa May deal leads to some form of legally leaving the European Union, but not a complete one. 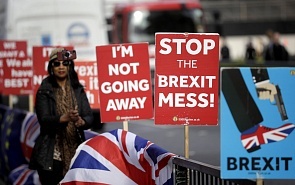 The current manoeuver of the members of Parliament is effectively to postpone the exit from the European Union to try either to gather another referendum, which they hope will lead to Great Britain staying in the European Union, or simply delaying it for having terms, which would effectively keep Britain bound into the European Union in some way. That, I think, would be a real defeat for democracy in the United Kingdom and will lead to very considerable dissatisfaction, and probably to a civil strike. My feeling is that it will not happen quite in that way. Either the decision will be postponed or there will be some agreement that will keep Britain strongly linked to the European Union, without effectively being a member of it. The idea that Britain will continue to be a member of the European Union is most unlikely. If Britain leaves the European Union, the European Union itself in terms of its geopolitical strategy would be much stronger. Apparently, Britain represents the Atlantic Alliance's interest - it was the particular voice of the United States in the European Union. Without this Atlantic presence in the decision-making of the European Union, it will be much more independent from the Anglo-American alliance. This would possibly mean a more independent foreign policy; there could also be a change in the policy towards the Russian Federation. If Britain stays in the European Union, I cannot really see very much change in terms of its policy. However, Britain's position would be weakened within the EU, its voice would not be as loud as it was in the past. ﻿﻿After the Parliament’s latest vote, the next step is to see how the EU will react to the idea of Brexit being postponed. This raises a number of challenges, primarily because the EU has to reach a unanimous agreement in order for Brexit to be delayed. So the no-deal scenario is still on the table.